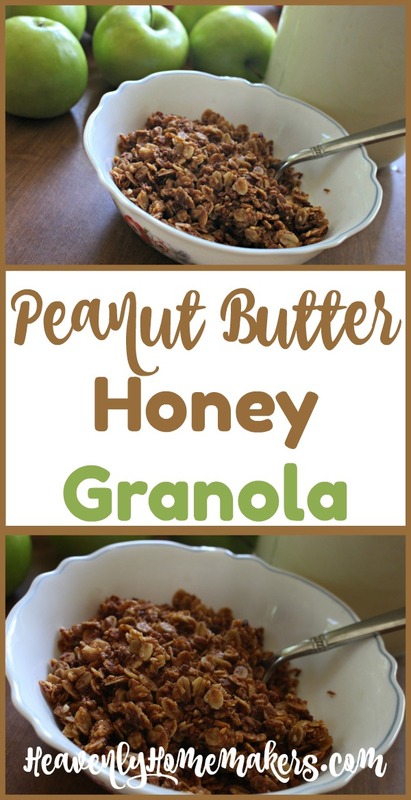 Save big bucks and use the finest ingredients when you make this Easy Peanut Butter Honey Granola! Confession: Sometimes I buy granola at the store. The kind that comes in a box or a bag. The kind that costs more than a pound of grass-fed beef. Why do I do this? Because it’s convenient. It’s tasty. It’s fun. And because life gets extra full, therefore sometimes store-bought conveniences feed the family and I don’t even feel bad about it. Interesting fact: I used to think I was busy (because indeed, I was certainly never bored). Then God suddenly and beautifully made us a foster family. Overnight, I learned what “busy” was in a brand new way. Simultaneously, I began to learn that nothing in this world matters more than loving God and loving people. Never again will I say, “I’m so busy!” with a negative or complaining heart (or at least it is my goal to keep life in perspective like this). How blessed we are to have such full lives, surrounded by so much love and goodness from the Father! He is the ultimate, perfect provider. I am learning that if we are “busy” loving God and loving people, the rest will all fall into place, whether it’s schedules, appointments, work, laundry, meals, school, dishes, or any of the many tasks that fill our days. And for the record, sometimes I am “busy resting” because God provides for that too and I’ve learned to take full and glorious advantage of down time and moments of quiet. Well now, what an interesting way to introduce our new Peanut Butter Honey Granola recipe. I can’t help it. I bought some Peanut Butter Granola in a bag on one of “those days” but wanted to try my hand at making some at home with all of our favorite whole food ingredients and for a fraction of the price. Our 4-year old foster son jumped right in to help me because “I wike to help Mama Copp cook!” Seriously, this is the best “busy” I’ve ever been. Measure coconut oil, peanut butter, salt, and honey in a large cooking pot. Heat and stir together until melted and well-combined. Add oats, coconut, and seeds, stirring well. Spread mixture on a parchment paper-lined cookie sheet. Bake in a 350 degree oven for 20 minutes, then stir. 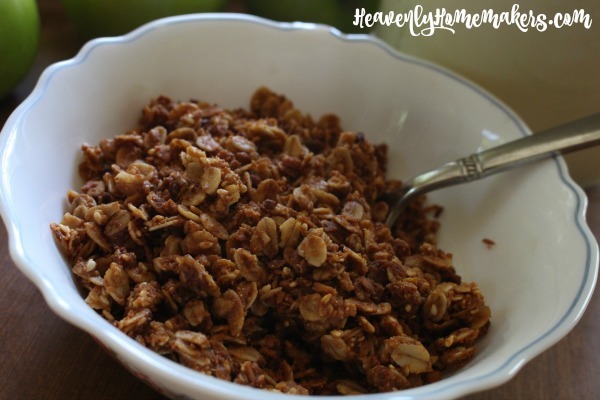 Remove from oven and allow granola to dry on the countertop for about one hour. 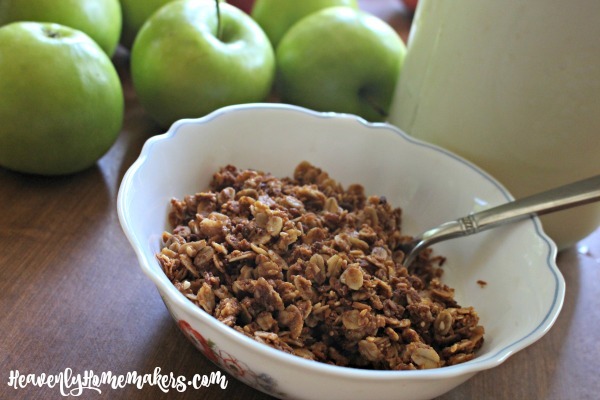 Transfer granola to an air tight container. Stir some mini chocolate chips for an extra special breakfast or snack. What’s your favorite flavor of granola? Looks delicious, and it sounds like you had some awesomely adorable help! This is great! This is one of the items I love to buy at Aldi–they have some fun and relatively inexpensive organic options. However, we are on a “spending freeze” and trying to really avoid those “extra trips” to the store. This is a perfect recipe for our family to still enjoy eating without braking the bank this month! Thanks!